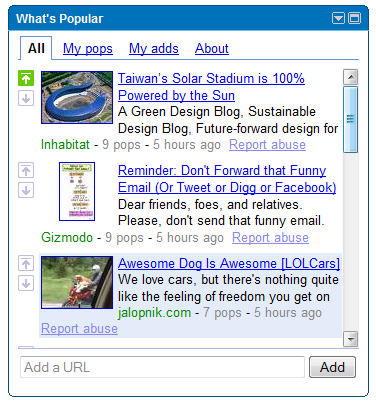 The "What's popular" iGoogle gadget, launched last month as a simple way to discover interesting web pages, has been improved and you can now automatically add the shared items from Google Reader. The option is disabled by default, but you can enable it in the new settings page. "Automatically submit items you share via Google Reader into the What's Popular gadget. These shares will be attributed to you. 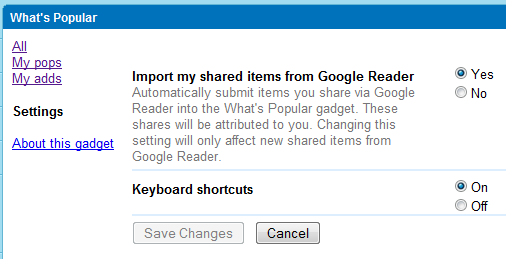 Changing this setting will only affect new shared items from Google Reader." Google's gadget includes web pages from different sources: user-contributed pages, popular posts from Google Reader and popular videos from YouTube. You can rate the pages that you like or dislike by clicking the voting buttons displayed next to each item, much like in Digg, Reddit or Yahoo Buzz. The gadget can be added to your personalized Google homepage, but you can also bookmark this URL. "What's popular" has less than 17,000 users, but that's probably because Google hasn't officially launched it yet. Google Reader has an enormous amount of attention data (starred items, shared items, pages that are read or emailed), but it didn't use it to recommend popular posts, except for the "What's cool in Google Reader" feed. This is really cool. I'd love to start collaborating with others so we can continue to make our Reader.Google experience better. Anyone interested.. let me know?